Many tribes of Indians, under the leadership of their chief, Philip, banded together and vowed that they would not rest until every white man was driven from the country. There were so many Indians in this league that it seemed for a time as if their threat would indeed be carried out. The first attack was made upon the people of Swansea. The people had all been gathered together in their little church, which you remember was more like a fort than a church. As they came out, and were walking slowly homeward, suddenly there was heard the Indian war-whoop; and in an instant there burst out from the forests troops of Indians armed with guns, arrows, clubs, tomahawks—anything with which a deadly blow could be given. After this, the Indians fell upon all the towns and upon the farms scattered about over the country. If you ever read the history of King Philip's War, you will find it full of terrible stories of the cruelty of these Indians, and of stories, sad, sad stories, of the poor women and children who were cruelly murdered or dragged away to be made slaves of. The Indians were continually on the watch. When men went out to work, they would be shot down by an unseen foe. The women at work in their homes would be shot by a ball or an arrow coming in through the window. King Philip's right-hand man in this war was Annawon. He it was, who, in the midst of the fire of battle, could be heard shouting to his men, "I-oo-tash! I-oo-tash!" meaning, "Stand to it! Stand to it!" At last, in August, 1676, King Philip was surrounded in a swamp at Mount Hope and killed. "Now," said the colonists, "if we could capture or kill Annawon, we should be safe." Finding that Annawon had made his camp in another swamp near by, Captain Church, one of the bravest of the colonists, set out with a companion and some Indian guides to find it. Soon they came in sight of it—down in a deep recess among the hills. There lay Annawon himself, stretched out before his tent half asleep. Slowly and quietly they climbed down, and before Annawon even knew of their presence, Captain Church stepped across the chief's body and took him prisoner. 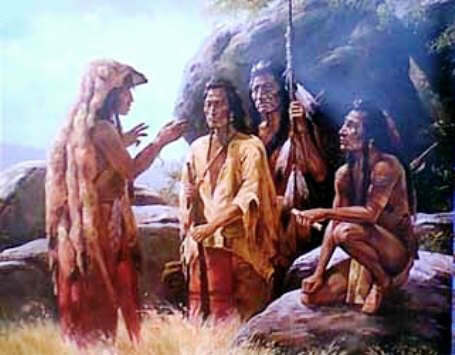 Meantime, the followers of Captain Church went to the other Indians lying about before their camp-fires, and told them that their chief was taken, that there were hundreds of white men just outside the camp, and that their lives should be spared, if they would surrender at once. Captain Church, exhausted with his long march, now lay down close to Annawon and slept, throwing his foot over Annawon, so that the least movement would awaken him. For two hours the captain slept. When he woke, he found Annawon lying with eyes wide open staring at him. At last, Annawon arose and stalked off into the forest. As he had surrendered his arms, Captain Church allowed him to go, wondering what he would do next. Soon he returned, bringing a war-belt, which had belonged to the Indian chief, King Philip. Laying it at Captain Church's feet, he said, "Great Captain, you kill King Philip—you capture me—now the war is ended—this belt belong to you." This story of King Philip's War is featured in the book entitled American History Stories, Vol. I. (Revised Edition), by Mara L. Pratt, Boston: Educational Publishing Company, 1908.